At 2901 S. Wabash in the hot high school cafeteria of Ada S. McKinley Lakeside Academy, a group of five summer culinary arts apprentices are scrambling to arrange a breakfast on a white plate. They want to get the look just right. One apprentice adjusts the triangular chocolate waffles a little inward on the plate so they don’t hang too far over the edge. A second places ripe strawberries across the waffles. The two step back and assess. Next comes the white chocolate sauce looping over the strawberries and beside them an omelet draped with a basil leaf and two pieces of bone-in ham. Quick hands adjust the angles and wipe away the excess sauce. The meal looks perfect—and just in time. One of the apprentices carries the meal over to instructors Tamika Thomas and Regina Williams who wait, prepared to issue a final judgment based on a five point criteria, including creativity, visual appeal, temperature and tastiness. The Ada S. McKinley Culinary Arts Institute is just one of six summer After School Matters programs that ASN is managing this summer in collaboration with partner schools Antonia Pantoja High School, El Cuarto Año High School, Dr. Pedro Albizu Campos High School, Ada S. McKinley Academy – Lakeside, Chatham Academy High School, and Sullivan House High School. Student filmmakers from Chatham Academy High School. At two of the locations, ASN hired video instructors referred to us by our longtime partner and network member Community TV Network (CTVN). 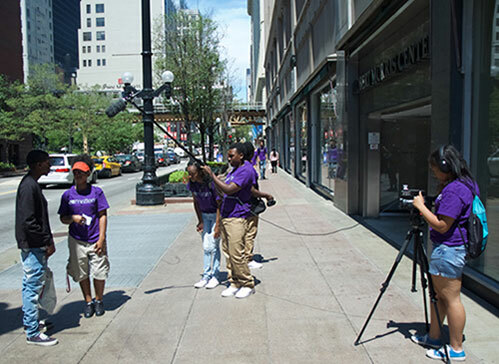 This summer, these instructors provided hands on technical training to support teens in developing original digital media touching on themes and ideas that respond to the interests and concerns of the apprentices, their schools, and Chicago’s local communities. At Chatham Academy High School, instructor Chakka Reeves linked youth to relevant news stories. Working with CTVN’s journalism specialist (funded through a grant from McCormick Foundation), Marissa Warner, and accompanied by television producer Amber Milan Watson, Reeves led the young video makers on a tour of the Chatham neighborhood in search of stories on a news scavenger hunt. Youth learned about resources they never knew existed and produced stories that illustrated their discoveries. They screened their work for school staff and families at their culminating event titled South Side Stories, in collaboration with another ASM program from Winnie Mandela Intergenerational High School and instructor Bill Sacco. At Aspira’s Antonia Pantoja High School, CTVN instructor Jonathan Mueller and the ASM apprentices also held a culminating event for school community and parents. This group also participated in a news scavenger hunt with Marissa Warner of CTVN, which led to a profile of a local ice cream and smoothie shop. In addition, students dabbled in digital effects, green screen tricks, animation, and spoofs to create a diverse set of videos for their final reel. Sullivan House High School hosted an ASM summer program led by their staff teacher Victor Moore. This video production group explored the power of documentary film making, developed an original documentary concept, researched the school’s history, wrote interview questions and conducted interviews, and edited a final 18-minute digital piece profiling their alternative high school. The video they produced — working only with a small digital video kit including two consumer level video recorders, one directional microphone, a tripod and a lavaliere microphone —will be used as part of their incoming student orientation in September. Live in Humboldt Park brought together two working artists —Melissa DuPrey and Michael Reyes — to lead a performance program with 30 teens. 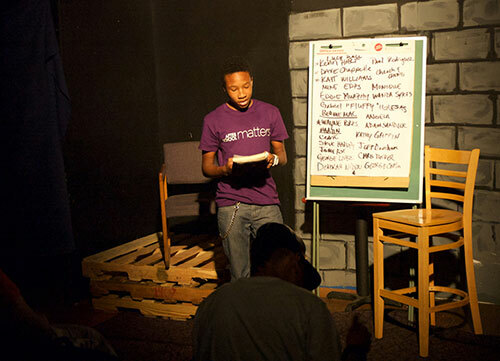 Hosted by the Juan Antonio Corretjer Puerto Rican Cultural Center in the youth space Batey Urbano, the teens worked to create a 30-minute variety performance examining the issues that arose from their writing and theater workshops. The culminating performance was held that the National Museum of Puerto Rican Arts and Culture, and combined digital video, slideshows, recorded music, and live performances that engaged issues such as current national events, relationships, racism and police brutality, housing and gentrification, and teen violence. In addition, ASN partnered with two schools, Dr. Pedro Albizu Campos High School and El Cuarto Año High School, to provide ten internships. Teens worked within the schools to gain job experience assisting office and program managers, beautifying and maintaining the schools’ infrastructure, leading student outreach, and assisting in running summer school programs. Special thanks to all the instructors who gave so generously of their time and energies to produce this unique and powerful set of programs with ASN and its partner schools.